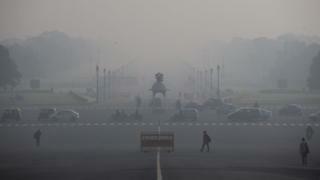 India's Supreme Court has announced a slew of measures to curb record air pollution levels in the capital, Delhi. It has ordered a temporary ban on the sale of large diesel vehicles and stopped trucks more than 10 years old from entering the city. Delhi is experiencing hazardous levels of pollution due to diesel emissions, construction dirt and the burning of crop stubble in farms around the city. India has 13 of the world's 20 most polluted cities, the World Health Organization (WHO) reported last year. On Wednesday, the top court said that new diesel luxury cars and sports utility vehicles (SUVs) with engine capacity of more than 2000cc cannot be registered in Delhi between 1 January and 31 March 2016. It is not clear whether the sale of these vehicles will resume after March. "Rich people can't go round in sports utility vehicles polluting the environment," the judges said. The court also doubled an environment tax on all commercial trucks entering Delhi, and said it would consider an environment congestion charge on all diesel vehicles when it meets again in the new year. Also, the court said all taxis operating in Delhi as well as in districts in the neighbouring states of Haryana, Uttar Pradesh and Rajasthan would have to convert to natural gas by 31 March. Critics have questioned how this will be enforced, and wonder how the police will be able to spot taxis violating the order. Car sales are soaring in India, with 1,400 new vehicles taking to Delhi's streets every day. Commercial trucks account for more than half of India's vehicle emissions. As pollution levels in Delhi have reached alarming levels in the past few weeks, the Delhi high court said the city resembled a "gas chamber". The Delhi government then announced that from 1 January 2016, private vehicles with odd and even registration numbers would only be allowed to operate on alternate days.